Understanding today’s emission systems and complex electronic engine controls can be a real chore, even for us experts. Chances are you’re reading this article because you are having trouble with your EGR/DPF/DEF systems. This article will help you understand how they work and provide options for tuning your truck for better performance and fuel economy. Today’s engines are controlled by an Electronic Control Module. It’s a computer linked to the vehicle by sensors and switches. This allows for intelligent monitoring and control and allows the engine to adapt to driving requirements or environmental changes such as higher altitude. Stage 1 of every truck modification start’s here. Just retuning your engine can achieve big horsepower and torque gains or better fuel economy and drivability. Stage two begins with a look at your vehicles aftertreatment systems. There are 3 systems currently used. An electronically controlled valve permits a small amount of vehicle exhaust to mix with the intake air stream. Less air in the cylinder during combustion means less fuel required, lower combustion temperatures, and improved emissions. 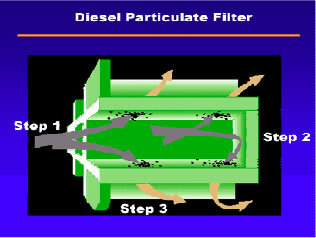 Approximately every 8 hours of driving use plugs the filter substrate and your vehicle goes into “REGEN MODE”. This means your truck dumps extra fuel down the exhaust stream, which ignites, causing flames to travel down the exhaust pipe through the DPF and burn the trapped particulate material. During this process your exhaust can exceed temperatures of 1100 degrees and may reduce the life of all attached components. For reference, the valves inside your engine begin to melt after 950 degrees and the REGEN process may last up to 45 minutes. The newest emissions reduction system adds another tank on your truck. This tank is filled with Diesel Exhaust Fluid or UREA. This is a mixture of 30% urea, a compound derived from urine, and water. When your exhaust pipe is hot, the fluid is injected and vaporizes. This high temperature causes the urea to form ammonia. The ammonia acts as a catalyst with exhaust gasses reducing them to less harmful compounds. Ready to tune your ECM? Depending on the changes you request, you may be required to purchase some additional equipment to ensure your truck runs smoothly. For example, if you want to remove your Diesel Particulate Filter and delete it from your ECM, you will need to purchase a J-ball DPF Replacement Canister. Many people are tempted to simply hollow out this filter, however this mistake can cause catastrophic failure. The exhaust is designed to have sufficient backpressure to keep your turbo from over-spooling. On average your turbo provides 30-40 PSI of boost, with no backpressure your turbo can over-spool before the governor can kick in to limit the RPM of the turbo. Short RPM spikes due to over-spooling can reduce the lifespan of your turbo and surrounding components. Failure to follow J-Ball recommended procedures for the exhaust system of your vehicle will void the ECM tuning warranty. If you use your vehicle off-road or race at the track you want to squeeze every last horsepower out of your engine. To achieve maximum performance removing the exhaust gas recirculation valve allows your combustion chamber pressure to operate at maximum output. This also lowers internal engine temperatures because cool intake air is not contaminated with hot exhaust gasses. 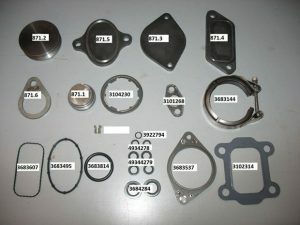 Our EGR delete kit comes complete with plates, clamps, seals and hardware to insure easy installation. Call 1-855-326-8863 for more information on emission deletion tuning for off-highway and racing applications. J-Ball Electronics will NOT be held liable for ANY costs incurred as a result of modifications outside OEM specifications. Please be advised that any truck modifications outside OEM specifications will void warranties, and as the customer you take full responsibility for all costs incurred as such. The customer must be aware of all operational requirements for legal use in their country and any ECM modification tuning done by J-Ball Electronics is strictly for off-highway, racing or sled pulling competition.